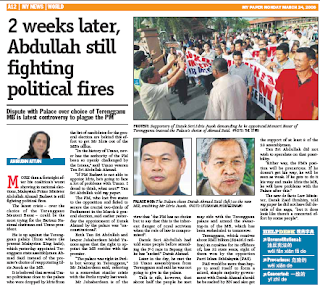 I spoke to DKL, Jahaberdeen and Zaid for this article. Read the PDF file here. Either way Dollah will lose. Should he spit on the face of Tuanku and appoint Josoh, Josoh will have rough times with the Istana in T.Ganu. At the federal level, The Agong will show Dollah who is in control by reuffing all his appointments particularly Judiary. Dollah is dead. Hail the Tuanku. ini umno, dia tableh denga la incik...besar punya batu dia kapla atas ada dudok...sama dia kita cakaaapp...sama kita dia banyaaaaaakkkk maraa....dei, ni poonggeddaaa...i don't care, i swear i dowan. Regarding the Trengganu issue, many are wondering why PM doesn't simply give way since he is in a weakened position. The answer could very well be the State secrets that Idris Jusoh has...for one thing : the state's petroleum royalties of about 1 billion ringgit annually and how it has been disbursed. Stay tuned. Main stream newspapers given impression rakyat and UMNO members fully backed Pak Lah and UMNO leadership choice of selecting Idris Jusoh. But Malaysiakini paint a different picture altogether, which one is true? I watched the Channel NewsAsia news broadcast this evening which reported on the elections in Bhutan that will transform the country into a constitutional monarchy and bring in democracy. Imagine - the election officials were marking the fingers of the voters with indelible ink. It was clearly shown on TV. Little Bhutan - first elections - can use indelible ink. Malaysia - can't get it right, as far as indelible ink is concerned! Maybe the Election Commission should go on a lawatan sambil belajar to Bhutan? The dust has settled with the swearing of the new cabinet, Now a storm is comming. Black cloud is hovering above our head. For the past few days KL have been raining heavily. Could it be the sign. The sign of doom for Malaysia or could it be the sign of 'V' to Malaysia. BN lawmakers is now for sale. There are news Anwar going round especially to Sabah and Sarawak shopping for lawmakers. There will be offers and bargains. Each of the lawmaker will have a price tag on their head. Buying will take place when the offer is right and lucrative. There are news that Anwar has promised 2nd deputy prime minister post to be rotated among Sabah and Sarawak. Anwar misread the people votes. Anwar thought opposition won 5 states and 80 parlimentary seats because of him, because opposition is strong. He is wrong. Opposition manage to break through due to the protest votes and due to low turn down of voters. Now Anwar true color has begun to be seen. If Anwar and Azizah really cares for the rakyat, they should have done the right thing when Anwar was the number 2.But they failed. If Anwar managed to bought over the BN lawmakers and become PM. will he be Anwar pre 1998 or Anwar post 2008. Anwar should reliase by now that Majority of Malaysian does not want him to become PM yet, not now otherwise PKR, DAP and PAS or the so called unregistered Barisan Rakyat would have won the election. For now Anwar should respect the people votes. The people had voted that BN still rule Malaysia and let the opposition rules the 5 states. Anwar should wait for the next election to see if he's wanted by the people to become PM, not thru this way of burning bridges to achieved his dreams. Its time for Anwar, DAP, PAS and BN starts working for the people benefits. Rule the 5 states and proved us you are better than BN, while BN should proved to us why we should elect then on the next election. Anwar action will only bring more problem to fellow Malaysian. His action could even trigger disunity among the people and could even create chaos among the present goverment supporter and the opposition . Let nature play it role. Anwar, you will be in Putra Jaya if that what the people wish for. Be a gentlement , you cant decide for the people, let the people decide for you. Let them decide what and who they want to rule Malaysia, not you Anwar Ibrahim!.You cant decide for the people.You can't vote for the people, the people will vote for you if they wish too. Days to come the true color will reveal. Let see if opposition true color will be blue or black to the people. Last four years whe have been in the grey just hopes its not black for the next 4 years to come. Opposition/Goverment should work together fot he benefits of the people. Respect the rakyat votes. Given the current scenario, in the Battle Royale between The Sultan and UMNO, the people are generally in favour of The Sultan. To his credit, Tuanku has done admirable things in the past including the appointment of the untainted Chief Justice. Tuanku must have known something about the former MB that we don't due to material omission in the MSM. But if we surf far and wide and are perceptive, we can decipher what the New Media is alluding to. Daulat Tuanku. disagree with antubiul, it all about leadership, crucial for anwar to take over now with defection cos AAB leadership weak and poor. wait and see approach will make the rakyat suffers, with no vote confidence of the rakyat, anwar and barisan rakyat ought be plan the seize now as the are the next goverment in waiting. why should we suffer to wait and see BR response in leading the 5 states while we have to bear another 5 years for AAB and umnoputras to plunder our nation wealth. AAB is on auto pilot in his dip into the oblivion, so why wait while he scheme mega projects scandal with his sil, awaiting to accend the throne of the cabinet. ding-ding said... Regarding the Trengganu issue, many are wondering why PM doesn't simply give way since he is in a weakened position. There are two issues where the PM seems to be inexplicably contrary. One, reinstating Mat Mat Taib into the Cabinet and two, having Idris Jusoh still as Terengganu MB. This is more than mere pigheadedness, this is totally going against the tide. Interestingly the common theme in both issues is AUSTRALIA and PATRICK LIM/BADAWI. ANTUIBUIL - I beg to differ. In politics there is no such thing as fairness. Anwar should have the "killer" instinct to seize the opportunity now when the "opposition" is getting weaker. No one wants to be ruled when you can rule - isn't it. You can set your own agenda and see the fruits of it rather than wait for the next PRU13. I do not side with either party but I love the spcio/political scenario now. This is history in the making and I must not loose a single bit of it. If the PM thinks he has got headaches now, he hasn't seen anything yet. Just wonder how nice and UMNO culture obedient all the UMNO delegates and division chiefs from these 5 states are going to be as now they got nothing to lose and also not exactly bribable with contracts and so on. UMNO has been like a nicely overfed dog that just sleeps and does what the master says. I guess by the time the next UMNO General Assembly comes along, there will be quite a lot of hungry dogs with no sight of easy food anymore They got to get out of their domesticated comforts to becoming like wild animals once again. To all Malaysian,pls go on street to protest 'Biadap'UMNO especially adullah badawi for his arrogant toward DYMM Sultan Mizan. March toward Istana Negara,all to wear yellow to show our support to our beloved KING.